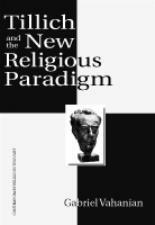 Title: Tillich and the New Religious Paradigm Author: Gabriel Vahanian Philosophical and Cultural Studies in Religion Imprint: The Davies Group, Publishers soft cover 148 pp. $20.00 US ISBN 978-1-888570-62-5 2004 Tillich and the New Religious Paradigm represents a creative and radical engagement with the enduring legacy of Tillich’s thought, and provides resources for renewing theological reflection in a secular world. The author does not simply survey Tillich’s theology; he engages it in a profound intellectual reading that pushes Tillich beyond Tillich. The secular and utopian aspects of Tillich’s theology are intensified through a dialectical process of critique and appropriation. Vahanian confronts Tillichian themes of being, kairos and the sacred with his own reflections on secularity, holiness and utopia. He takes issue with some of Tillich’s own conclusions by spelling out the logic of some of the processes inherent in Tillich’s theology. Vahanian shows us what Tillich could look like if pushed to a consistent extreme. This creative engagement with Tillich’s theology provides new resources for religious and theological reflection. Contents Foreword Chapter One: From Tillich to Tillich Chapter Two: A Quest for the New Religious Paradigm Chapter Three: The Secular: From the Sacred to the Holy Chapter Four: Utopia and the Sacred – Religion East and West Chapter Five: Kairos and Utopia Chapter Six: Word and Sacrament Chapter Seven: Jesus and the Christ Chapter Eight: Dogma into Poetry Notes About the author During a distinguished tenure as professor of religion at Syracuse University Gabriel Vahanian wrote several landmark books, the most well-known and influential of which was The Death of God. His God and Utopia (1977) led Jaques Ellul to describe Vahanian as a “true theologian.” In the mid-1980s Vahanian returned to France to teach at the Université des Sciences Humane, Strasbourg, after which most of his publications were in French, and inaccessible to a large part of his audience. Tillich and the New Religious Paradigm is his first book written in English in several years. In addition to demonstrating the significance of Tillich’s thought for contemporary theology, in Tillich and the New Religious Paradigm Vahanian makes accessible once again to a large part of the English-speaking world the profound art of thinking that distinguishes Gabriel Vahanian as a true theologian.